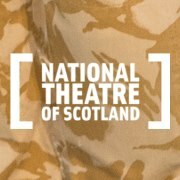 It’s seven years since the National Theatre of Scotland’s Black Watch made its debut in Edinburgh, and it’s still one of the best pieces of theatre you will ever see. The story, based on writer Gregory Burke’s interviews with former soldiers from the Fife regiment who served in Iraq, is told with a brutal honesty. The men were lured away from the boredom of Fife with the excitement of guns, the promise of admiration from girls who love a soldier, the prospect of playing footie with your mates on sunny foreign lands, and a steady job and income. But if they were bored in Fife, they were equally bored in Iraq, but placed in a foreign land where all is unfamiliar, unpredictable and dangerous. With expletive-laden dialogue, there’s no glamour. War isn’t romanticized. There’s a lot of hanging around, waiting in the searing dusty heat. They have time and they have questions. Ultimately it’s not the job they signed up for. To pass the boredom there’s in-fighting and chat about food they miss from home, as one soldier relays the mundane minutiae of his local Chinese takeaway menu. 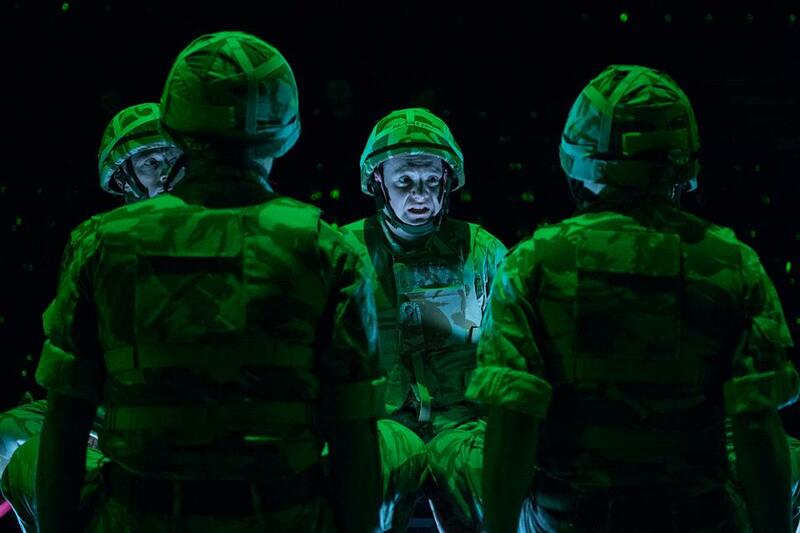 It’s hard to imagine two more differing worlds, than that of Fife and Iraq and the stage continually transitioned seamlessly between the two. Every prop was used to great effect and there’s the most surprising and innovate uses for a pool table you will ever see. The dialogue is brutally funny, brash and vulgar. One of the most entertaining characters is the pompous and blustering Lord Elgin, and an excellent performance by Stephen McCole. But cut through the swearing, bravado, and in-fighting boredom, and suddenly one scene sneaks up like a stealth bomber to assault your emotions. The soldiers receive letters from home – the dialogue is redundant. The brash words replaced by silence as each soldier conveys their words and emotions by gentle hand and arm movements. The well-placed music of Yann Tiersen heightens this already tender moment, which renders the audience silent and thoughtful. Music is put to brilliant effect all during the play and also includes The Flowers of the Forest played live on bagpipes and music from Davey Anderson including the Gallant Forty Twa. 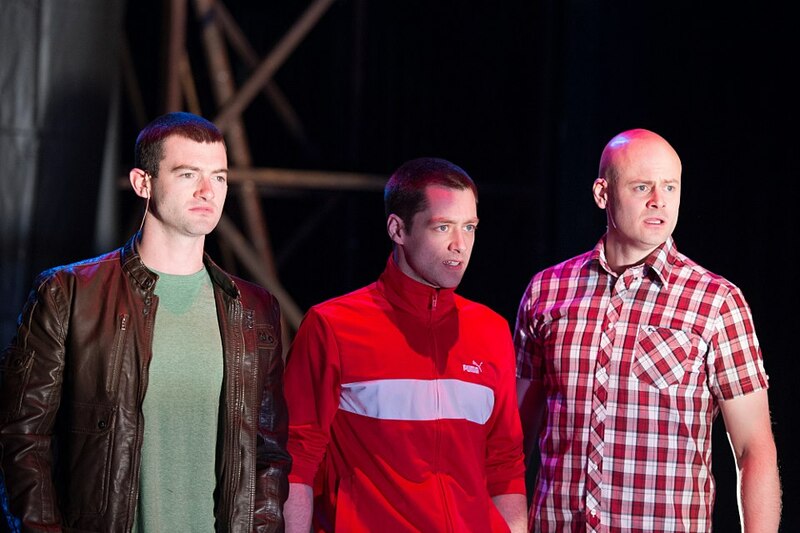 Directed by John Tiffany, the play has won 22 awards and played to more than 212,000 people. The 12 strong cast of this production features outstanding performances, particularly from Scott Fletcher as Kenzie, Robert Jack as Sergeant and Stuart Martin as Cammy. 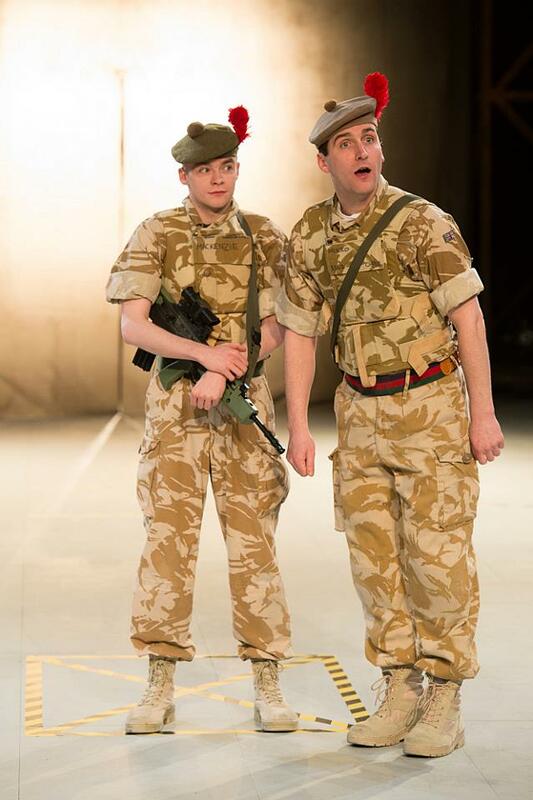 The choreography from Steven Hoggett is visually stunning, with a brilliant display of the proud regiment’s roots told through a series of cleverly orchestrated costume changes on stage. And an interesting contrast was that of seemingly putting battle to ballet. The subtleties of movement and dance were almost balletic in their approach, and they were used to dramatic effect to show macho aggressiveness and fighting. By the final scene there was another battle, that of trying desperately to hold on, with a choreographed finale of tenderness, friendship, caring, as well as sheer exhaustion, futility and sadness. It’s beautiful, balletic, and amazingly powerful. This scene will stay etched in your mind … and heart for a long time after. The show is now touring at Norfolk and Norwich Festival before moving to Seattle and San Francisco. 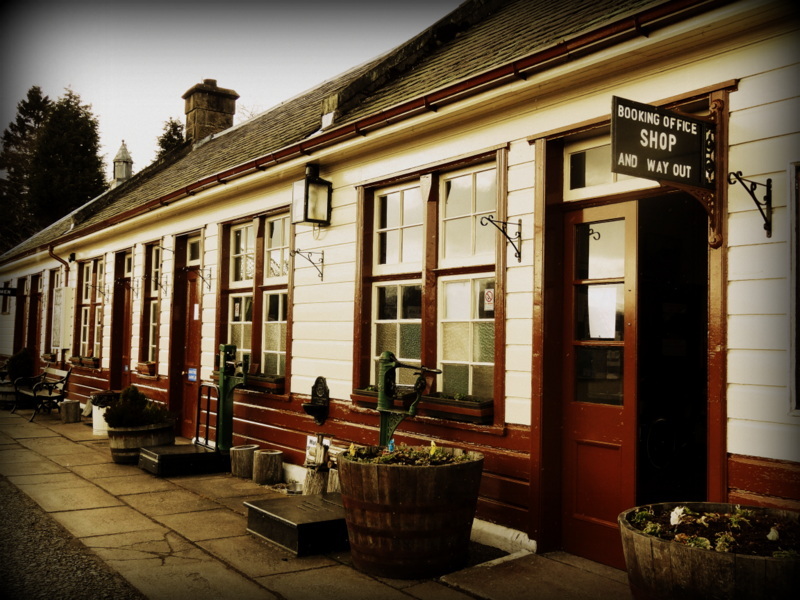 Boat of Garten, also called The Osprey Village, is around 4 miles north of Aviemore in Scotland’s highlands. 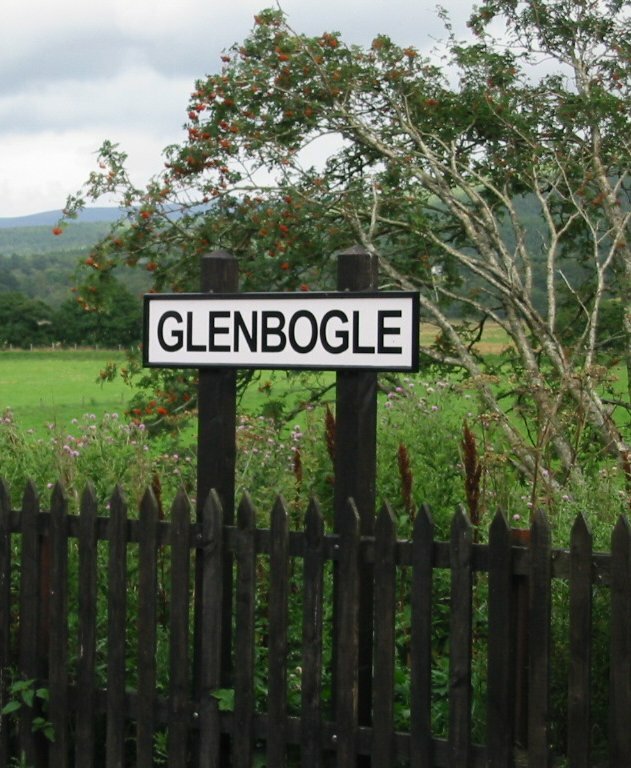 It’s at the heart of the Cairngorms National Park and surrounded by beautiful walks and views. Ospreys chose to come here when they returned to Scotland, and you can see them at the Loch Garten Osprey Centre. There’s a festival in honour of the birds on May 25, a day of wildlife themed events, which also celebrates the 10th anniversary of the Cairngorms National Park. 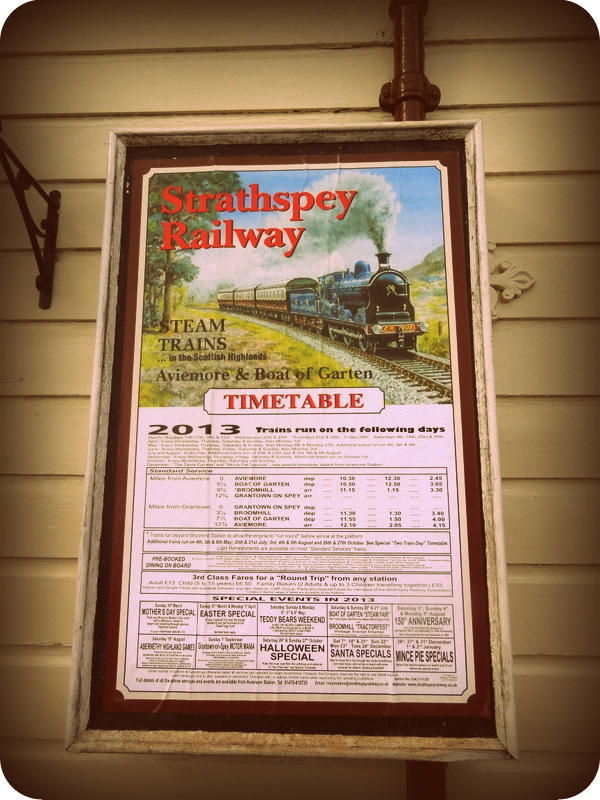 Jump aboard the Strathspey Railway and step back in time. 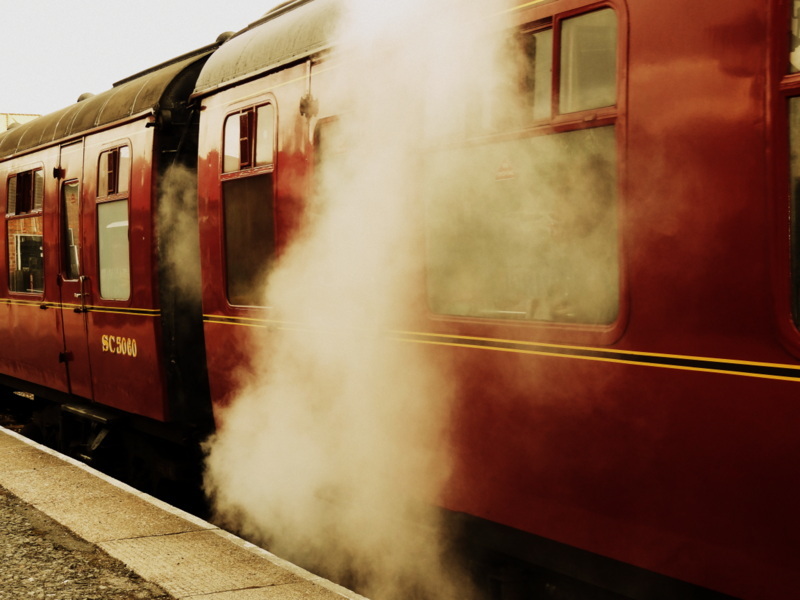 Experience the romance of travelling by steam train on this 20 mile round trip through Aviemore, Boat of Garten and Broomhill, which you might recognize as Glenbogle, from the TV series Monarch of The Glen. 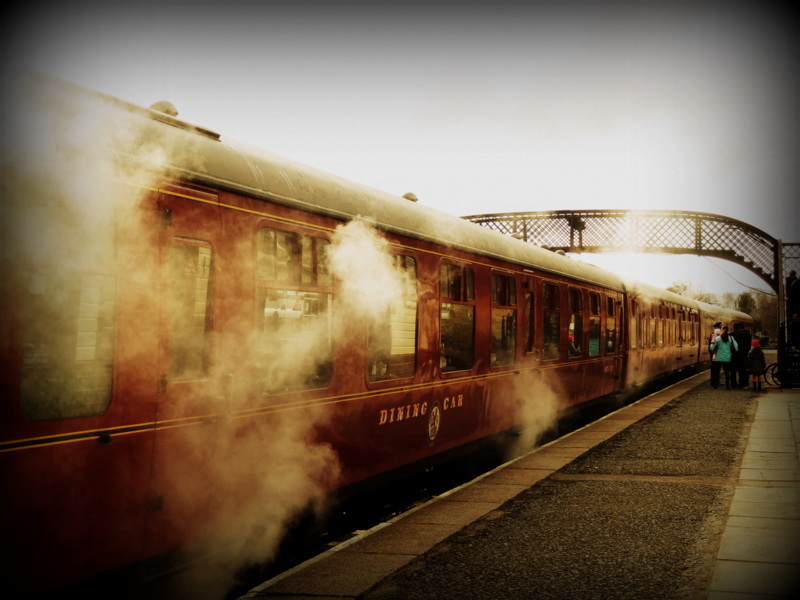 There’s options to travel first class and to have lunch or afternoon tea while having a relaxing trundle through the captivating Cairngorms. 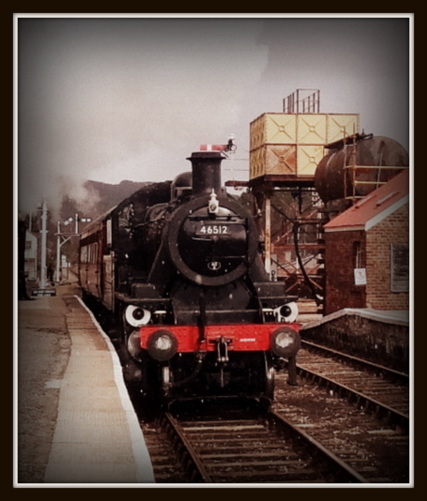 It’s also the 150th anniversary of the original Highland mainline and some special events are planned. There’s on board whisky tasting on April 28. 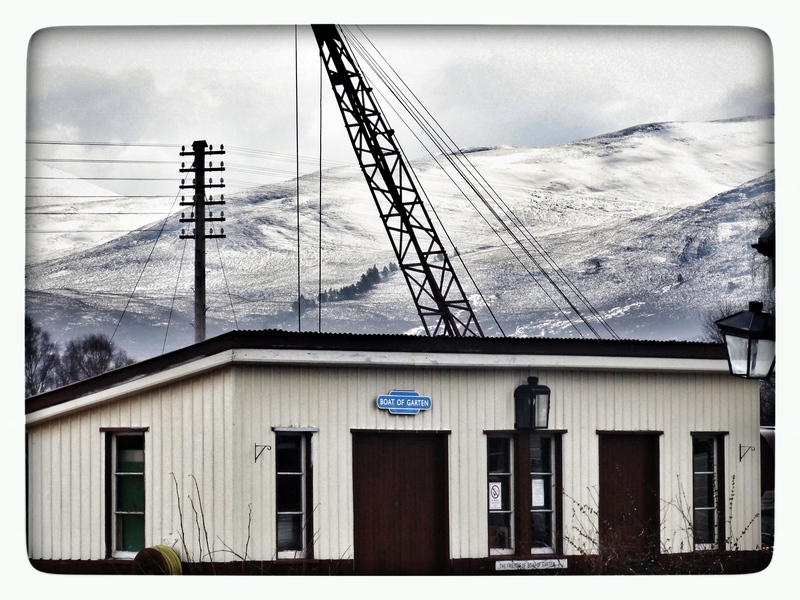 Boat of Garten train station was surrounded by snowy mountains in March 2013. 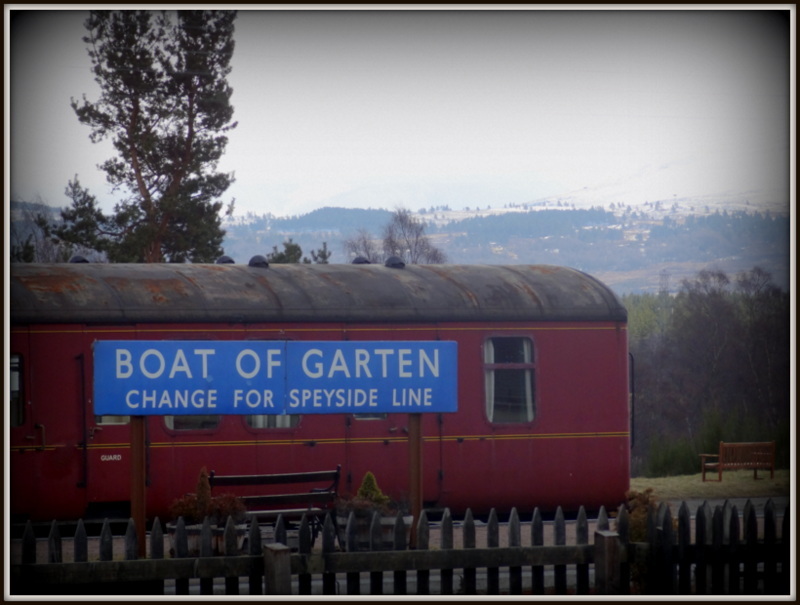 There were slight flurries of snow as the whistle blew and the steam train powered up and left Boat of Garten station en route to Broomhill. 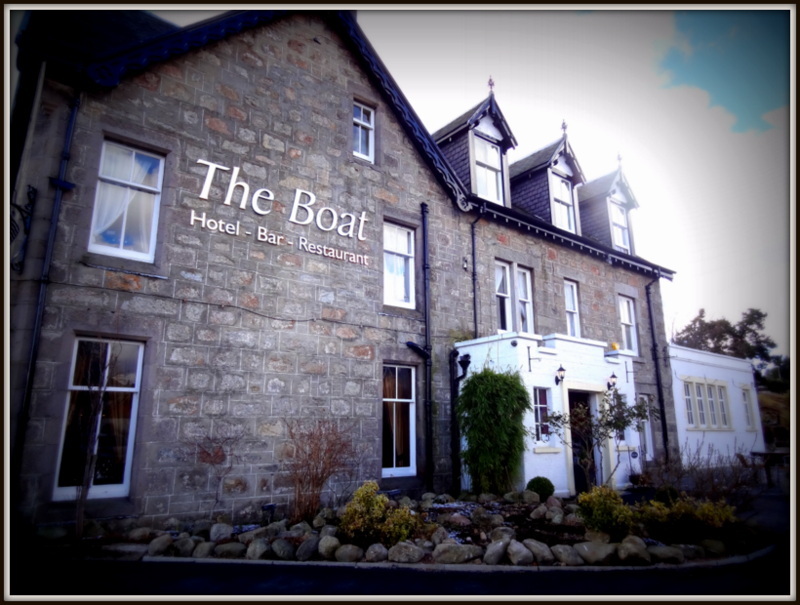 Next to the station at Boat of Garten is The Boat Hotel, where you are assured a warm Highland welcome. 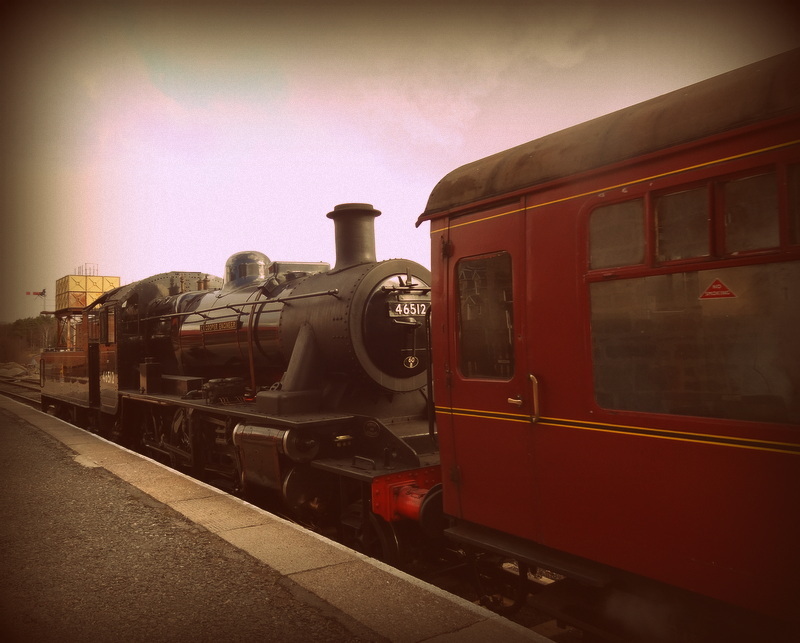 I stayed in one of the garden rooms, and enjoyed gorgeous views overlooking the railway to the hills beyond. It’s a perfect spot to stay while exploring the highlands, or to simply take advantage of the many walks and trails on the doorstep. 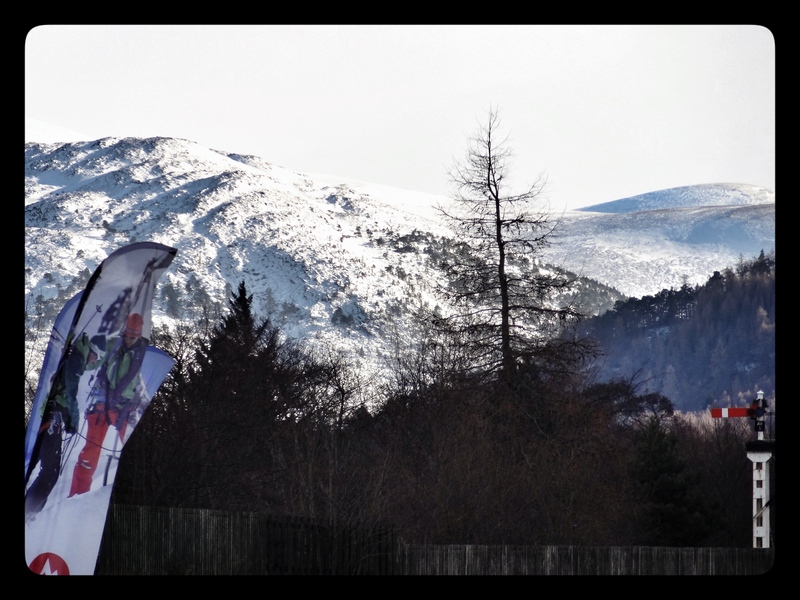 You’ll get plenty action at the Cairngorm Ski Resort while the hotel is adjacent the Boat of Garten Golf Club. Meanwhile kids will love the Landmark Forest Adventure Park at nearby Carrbridge. The hotel’s bistro boasts 2 AA rosettes for its food and service. 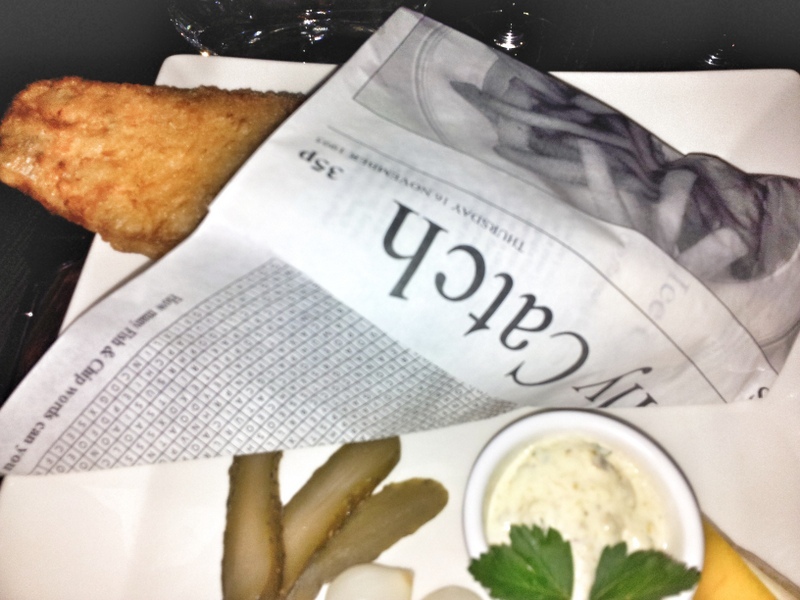 Tuesday nights are dedicated to fish and chips, and the fresh Buckie haddock with light fluffy chips comes wrapped in “The Daily Catch”. It was absolutely delicious and one of the biggest and freshest fish I’ve ever tasted. Although the hotel might have some exquisite and stately looking décor, it’s laid-back, welcoming and not at all stuffy. 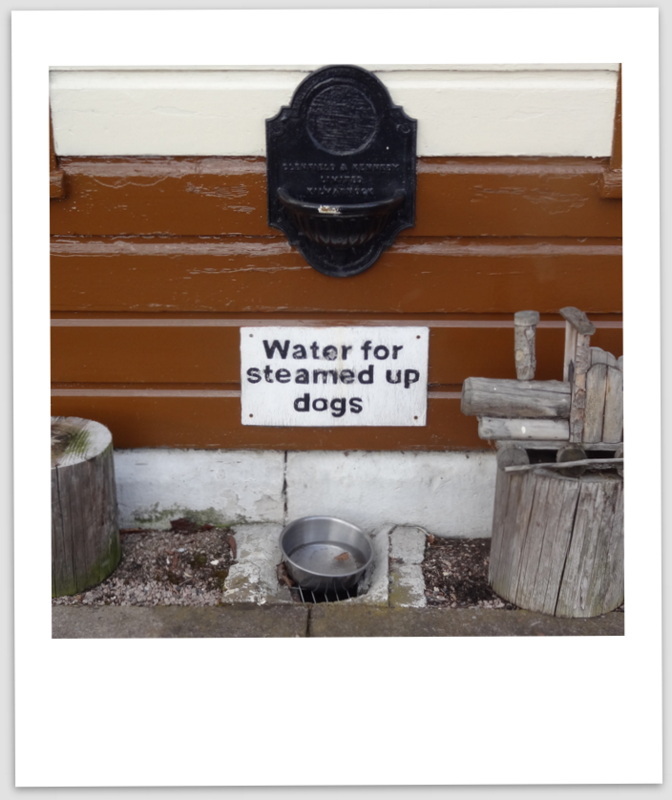 As well as romantic couples seeking a quiet Highland hideaway, you’ll also find families and people with dogs. Everyone is welcomed and catered for. The staff are particularly helpful and discreetly attentive. 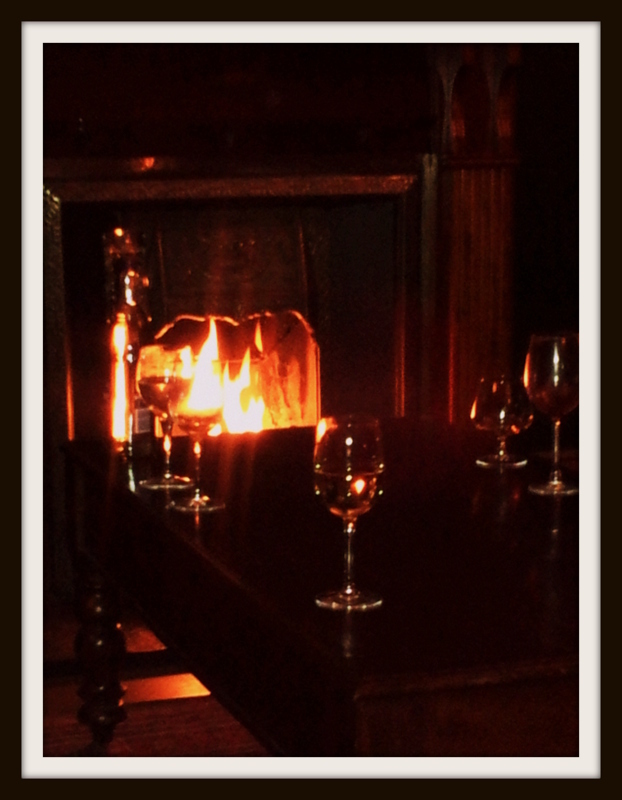 There’s real fires, comfy lounges and intimate bars where you can sit and enjoy a glass of wine or a few wee drams. And if you have a penchant for a dram, the Spirit of Speyside Whisky Festival runs from May 2 – 6. Expect to find 350 events with tours and tastings organized throughout the area which is home to over 50 distilleries. 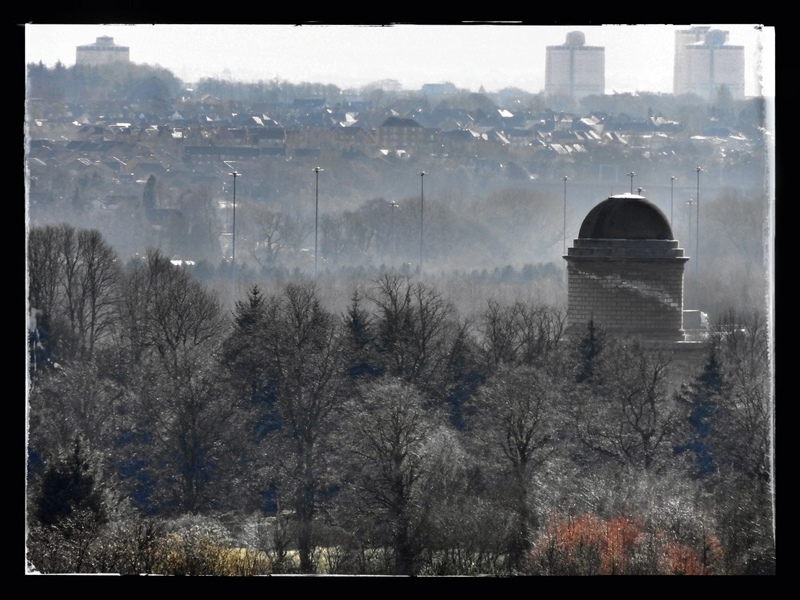 A misty April morning over Hamilton, Lanarkshire. 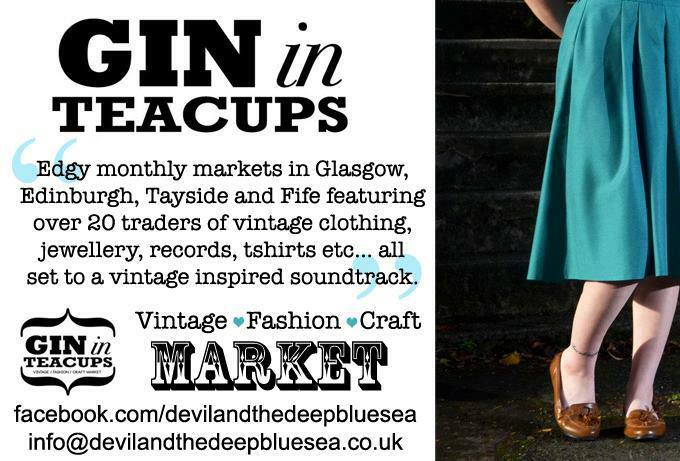 Gin in Teacups is an indoor-based vintage sale which operates throughout Scotland. 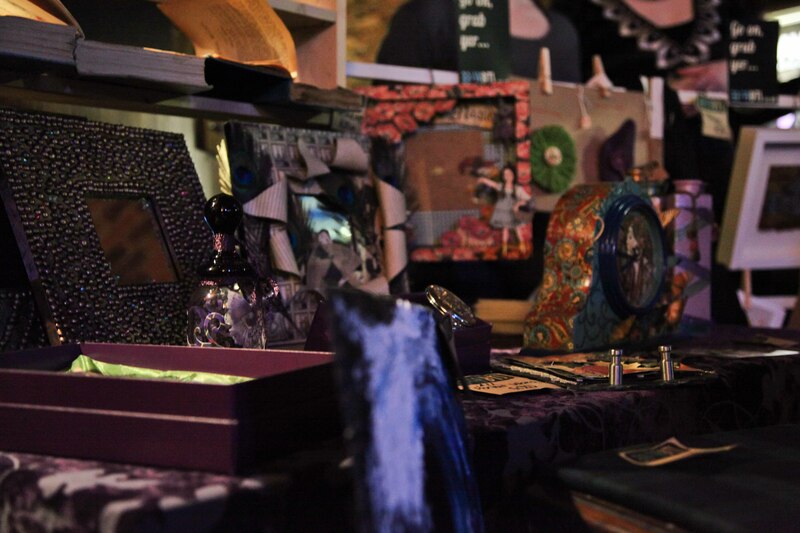 You can expect to find unique and bespoke handmade goods and everything from records to vintage clothing and jewellery, and lots of edgy designers. The popular sale with a twist is back with a bang this Saturday, April 6, 2013. 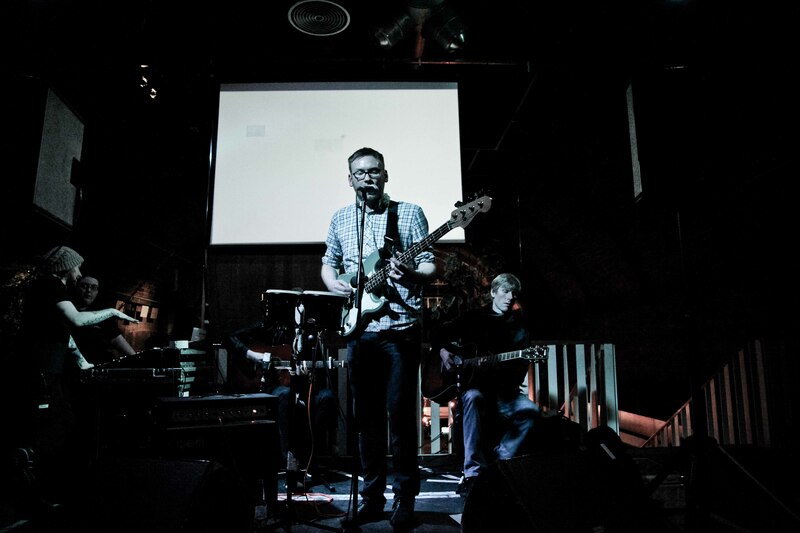 You’ll find it at The Arches in Glasgow from 12 noon to 5pm, free entry. Get there early and you could be in line for a special giveaway, if you are one of the first 40 people through the door. And if you can’t make it, don’t worry, Laurie Macmillan and Sarah Lawson, the girls behind Gin in Teacups have set their dates and promise lots more selling, bargains and gorgeous goods to come throughout Scotland all during the year. Laurie also chats below about their sale and what motivates them. For those of us who don’t know much about Gin in Teacups, tell us about it. Gin in Teacups is not only an indoor pop-up market showcasing the best of Scotland’s creatives, artists, jewellery designers, vintage traders, but it’s also a meeting place for these traders to network, inspire each other and bounce ideas around. The idea came from way back when we designed and made our own clothes. We were stocking in several shops but the huge commission rates made it less fruitful. We decided we could cut out the middle man and run our ‘pop-up-shop’ but we wanted to bring in more people and make it an alternative shopping experience. Who runs it and what’s your background? Do you have any other jobs? 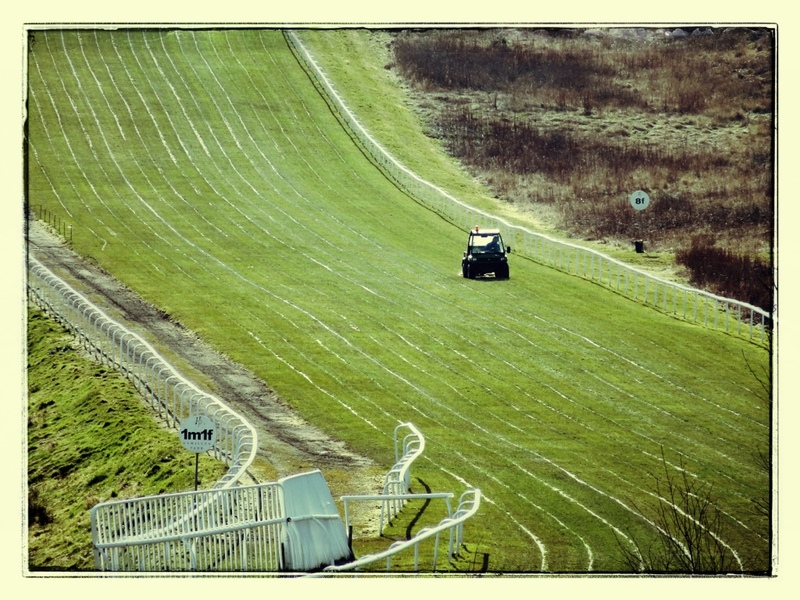 The event is run throughout Scotland by Laurie Macmillan and Sarah Lawson. They are both self-taught designers who went to high school together and always shared similar interests. They both work full time, Sarah as a manager for support workers and Laurie as a full time chef. The name Gin in Teacups is particularly cool. How did you decide on the name? We were wracking our brains for hours and nothing grabbed us, but for some reason that line stuck in our heads. It’s from a Babyshambles song called Albion. It also relates to the alcohol prohibition in the 1920s. What’s been your experience of organizing these events? It’s always a mix. You do work very, very hard to organize it. People drop out at the last minute, venues let you down and don’t fulfill their part of the bargain but it is fun, maybe we are a glutton for punishment. You also get to meet weird and wonderful people along the way and of course you pick up some smashing items and see all the fantastic things that people create. Going forward, what’s your plans for Gin in Teacups? We’d like to just keep scouting for new venues, new traders and to try keep it fresh. You’re back this weekend, who/what can we expect to see there? 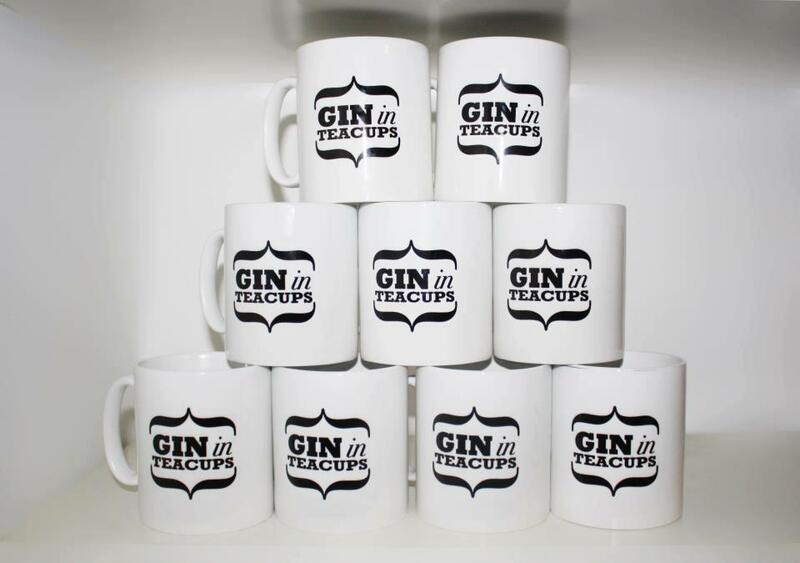 We will be having a giveaway for the first 40 through the door, which will be special limited edition gin mugs, and they are super cute. We will have 20 traders selling everything from gourmet cupcakes, handcrafted jewellery, hand-printed t-shirts, fantastic in trend vintage clothing and so much more. 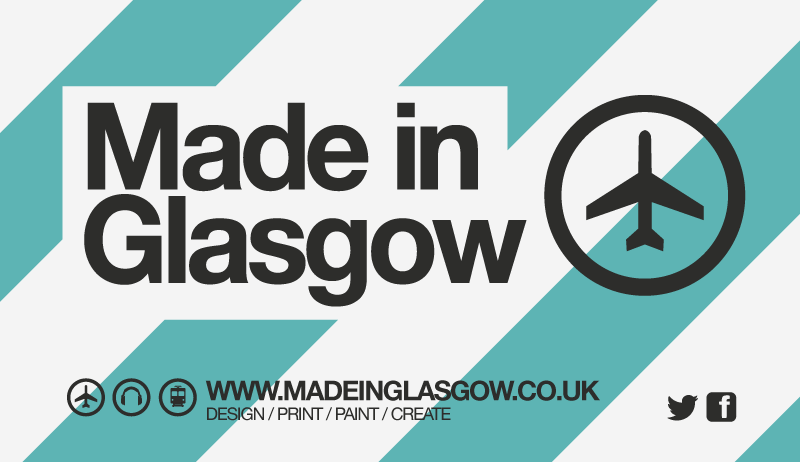 Made in Glasgow is a hub for creative people around the city to sell and promote their wares. It’s the brainchild of local designer Robert Chambers, who has his own business, TenTen, selling t-shirts, mugs, bags and other merchandise. He’s often to be found with a stall at various craft fairs and he got his idea while at the vintage fair Gin In Teacups. Looking around, he saw first-hand the huge amount of enterprising craft workers who make and sell everything from greeting cards, brooches, trinkets, clothes, furniture, bikes and hats. These are people with small businesses to run and grow. Some of them still have jobs while trying to get their side-line venture out there. Some of them juggle children while trying to get their own business started. They sell their goods at fairs, various shops and through their own websites. Robert’s new venture proposes to spread the net even wider and give them another platform for selling and promotion. It’s good news for sellers and buyers alike. 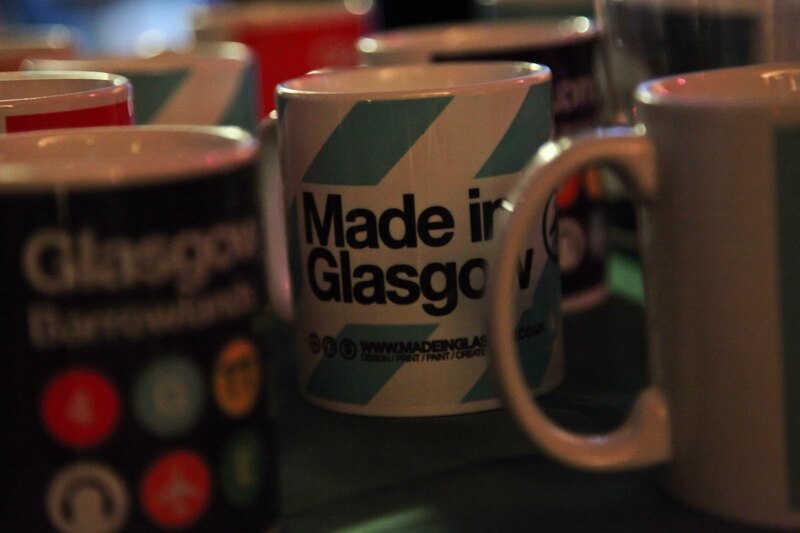 The Made In Glasgow website is a one-stop-online-shop for creatives to sell their goods. Customers can log in and expect to find an online shop full of lots of unusual gifts and buying ensures the support of local talent. And if you find something you like, spread the word and tell others. 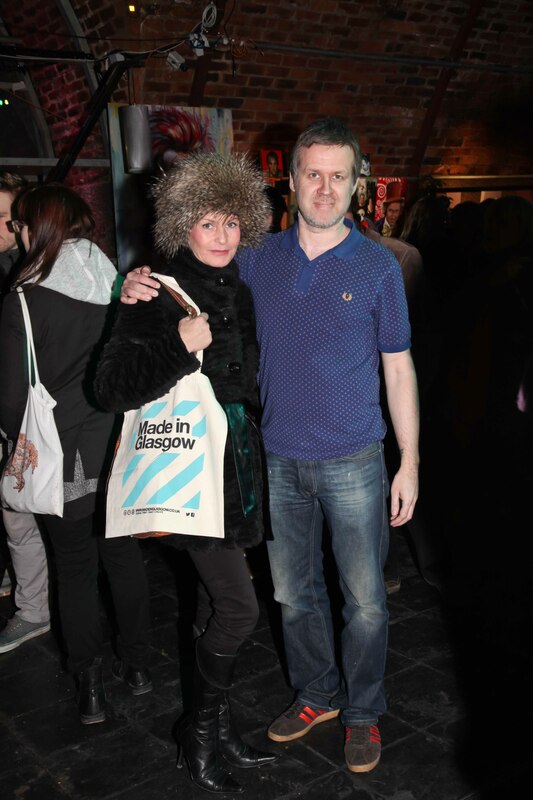 For buyers it makes great sense, it saves trailing the internet through lots of different websites where one will do and you can be assured everything on the Made In Glasgow site is authentic and exceptionally cool. 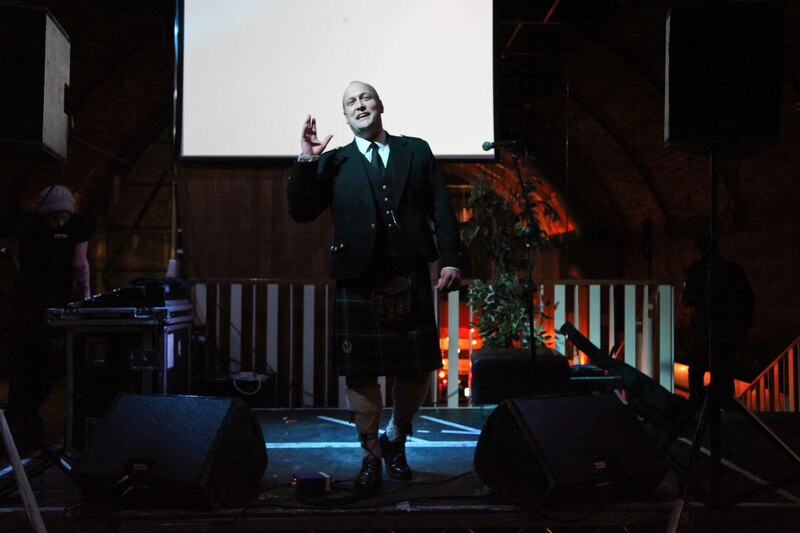 With a special launch night on March 25, 2013, to get the word out there, standing outside The Arches in Glasgow was the Caledonian Cowboy playing his bagpipes while inside there were stalls with a taste of what you can expect to find on the website. Also providing entertainment was local band Dead Man’s Fall, while later on the Caledonian Cowboy recited some poetry. 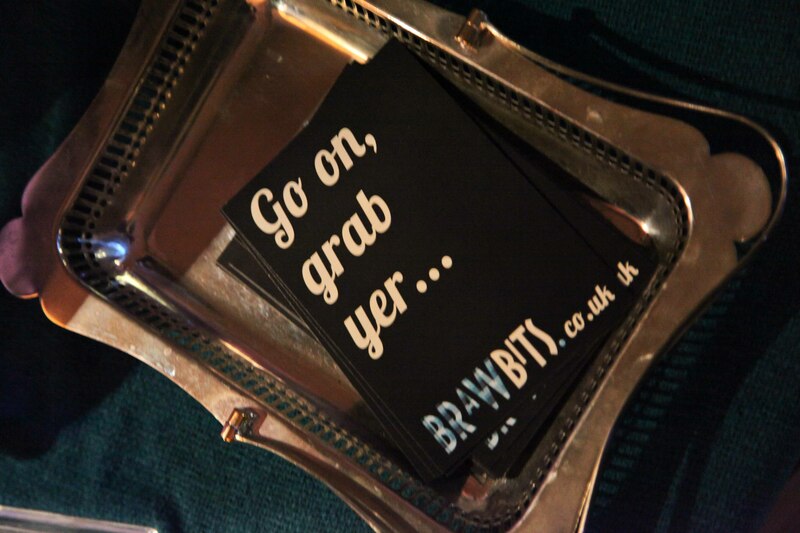 On the selling front there was Laura Morrison and Tina Cairns who run BrawBits. 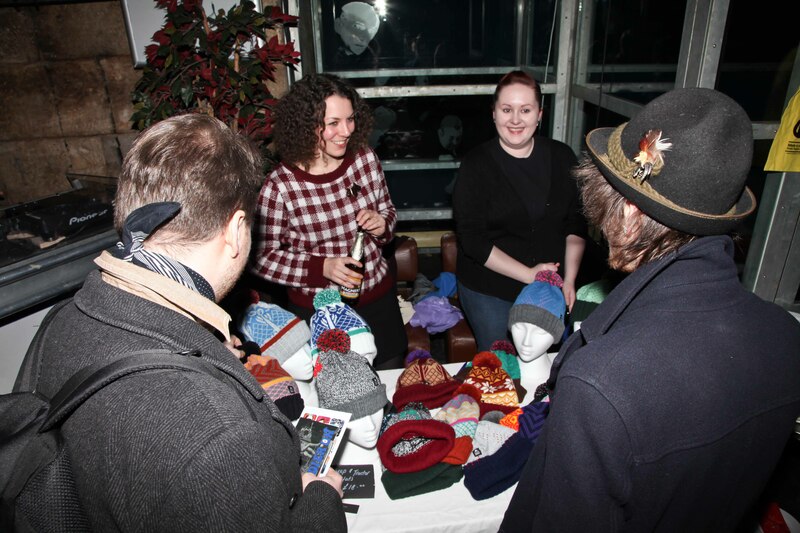 They’ve turned from maws to Braw and make lots of unusual goods from homewares to jewellery to textiles. Everything is original design and comes from recycled items. They’ve also designed a bag which doubles up as a mat. It’s a great idea for mums with kids out in the park having a quick picnic or for festival-goers. 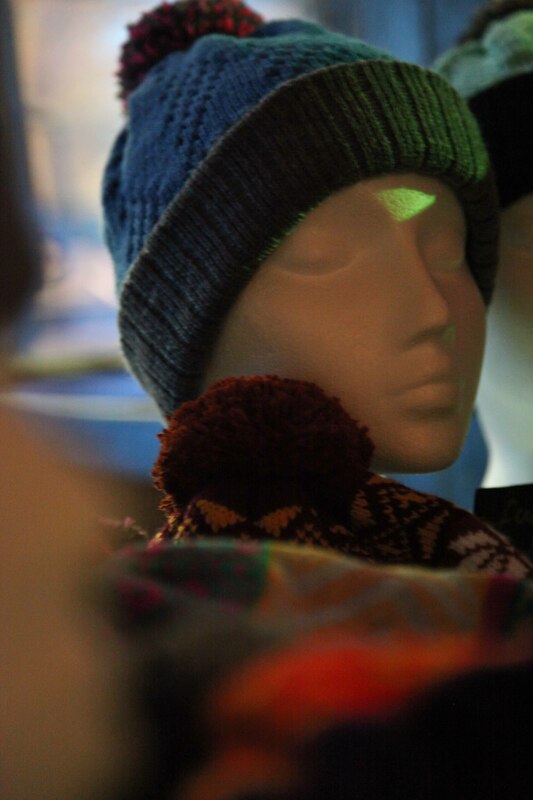 Wonky Woolies make woolly hats. These are super cool and super cozy, double lined with handmade pompoms on top and can be made to order. Ask for your own design or name and they will run one up for you. Fortune Favours The Brave is run by Tommy Wilson, who used to work at Scottish outfitters Slanji. 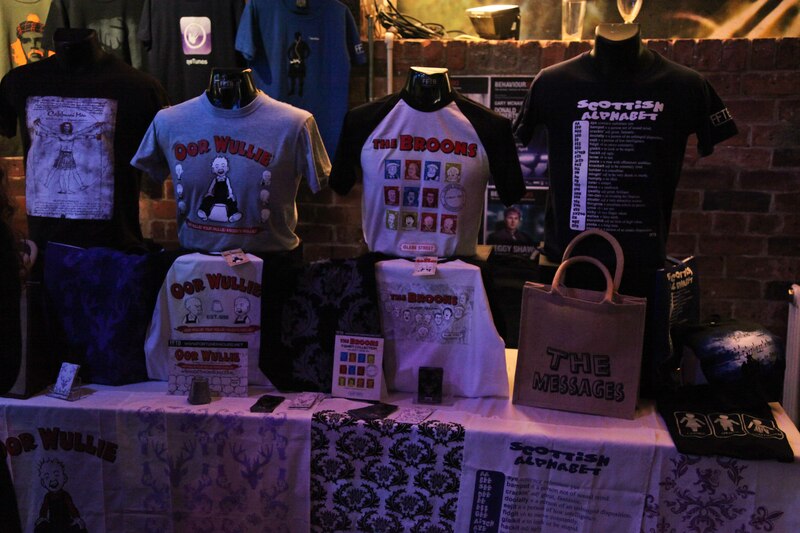 Through his experience he’s identified a niche in novel t-shirts and merchandise with a fun and quirky Scottish theme. 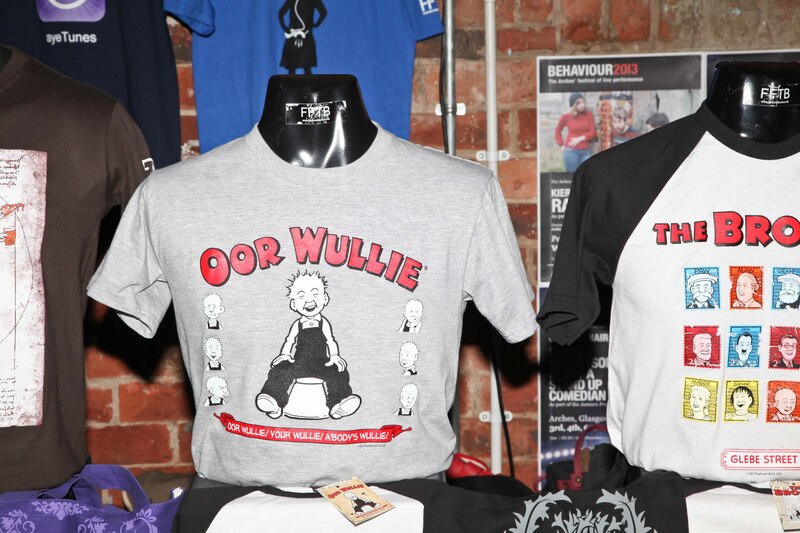 On display were t-shirts with everybody’s favourite scamp with a bucket, Our Wullie and famous family, The Broons. Tommy has also devised his own Scottish Alphabet, displayed on t-shirts, (he’s also working on a children’s version), while you can buy a wee brown bag for “The Messages” to carry all your shopping in. Tommy said all his goods are rigorously tested – the message bag is sturdy and will carry your bottles of wine home from the shops without bursting. Happy days! 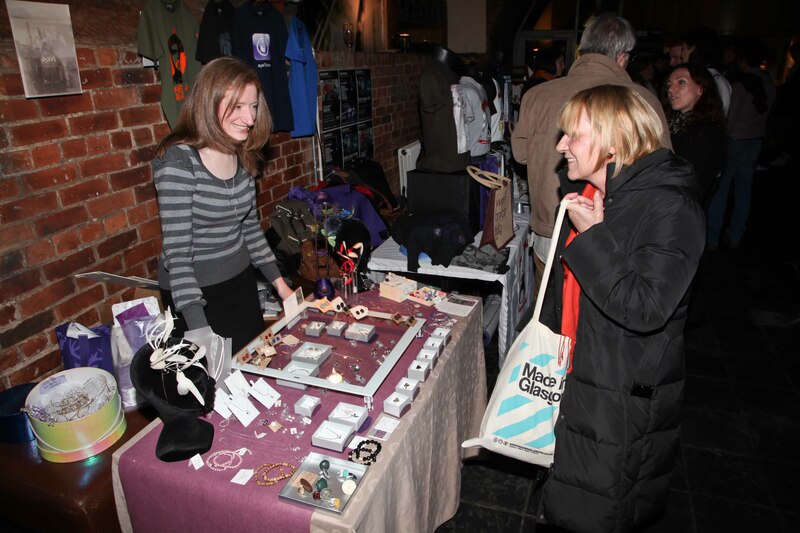 Selling lots of cool fashion accessories to appeal to the discerning vintage girl about town is DanYell. On display were cool wooden brooches, handpainted in quirky designs of teacups and teapots, as well as gorgeous designed scarves and greeting cards. A perfect stop to find an unusual and affordable gift. Danielle who runs DanYell juggles a full time job while building up her business. Full time artist Marcus Raynal Hislop runs the Notorious Gasoline Company. 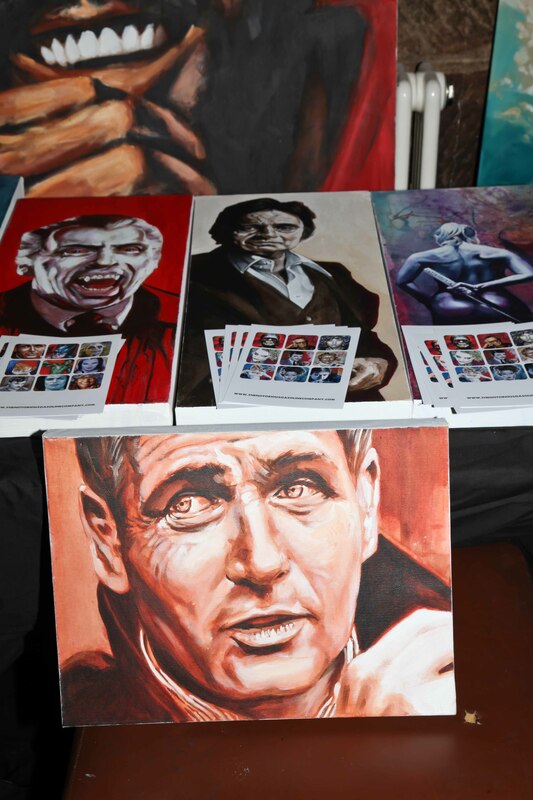 On display was a selection of his works of art, cool pieces of iconic people and everyone from Johnny Cash and Steve McQueen to David Bowie. 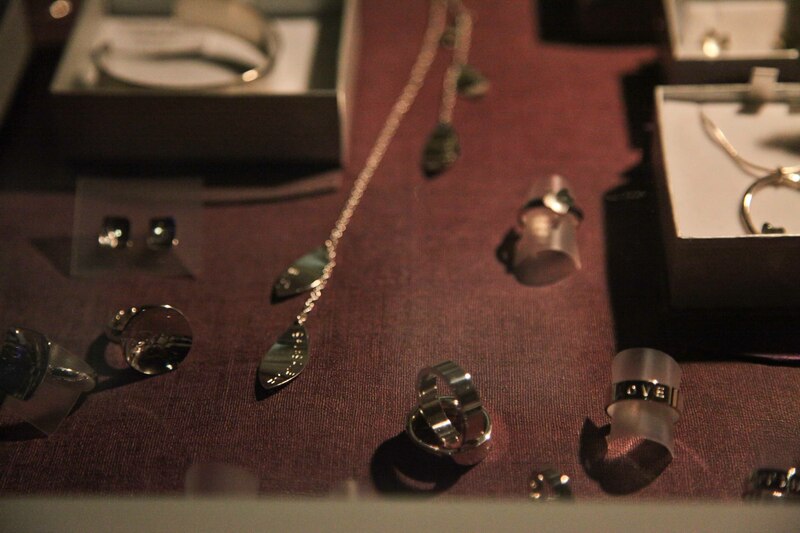 Pieces of jewellery are always welcome gifts or for a treat for yourself. The Eleanor Barron Collection comprises beautiful handmade pieces and a special flair for wedding accessories. Feather fascinators can be dyed to order, while you can order your own personalized rings, cufflinks and tiaras. But her wares are not just for weddings, there was lots of beautiful everyday jewellery on display too and all at affordable prices. 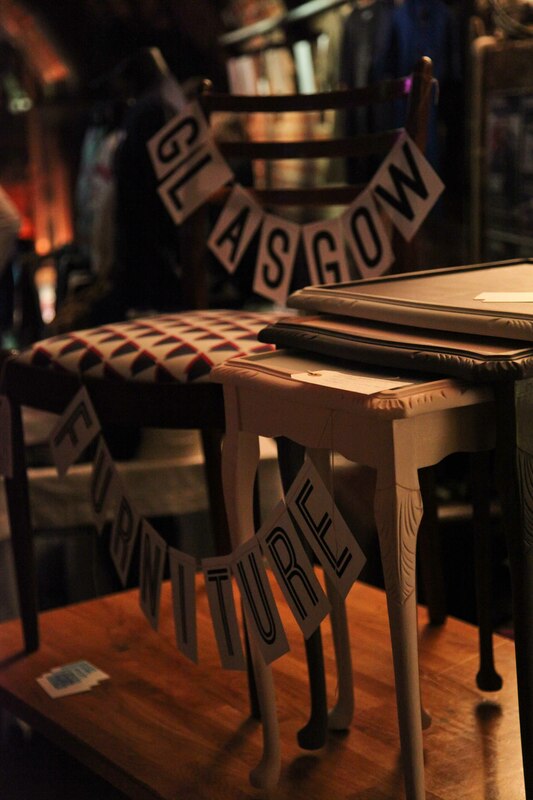 And from the smallest ring to the larger items, Glasgow Furniture Collective, sell gorgeous pieces for your home and perfect if you are looking for something that little bit different. Made In Glasgow is an exciting new venture and this was just a small selection of what you can expect to find online. There are lots of other creative people on board and the list is steadily growing. Meanwhile enterprising Robert has lots of exciting plans ahead, which include an accompanying magazine and further events. 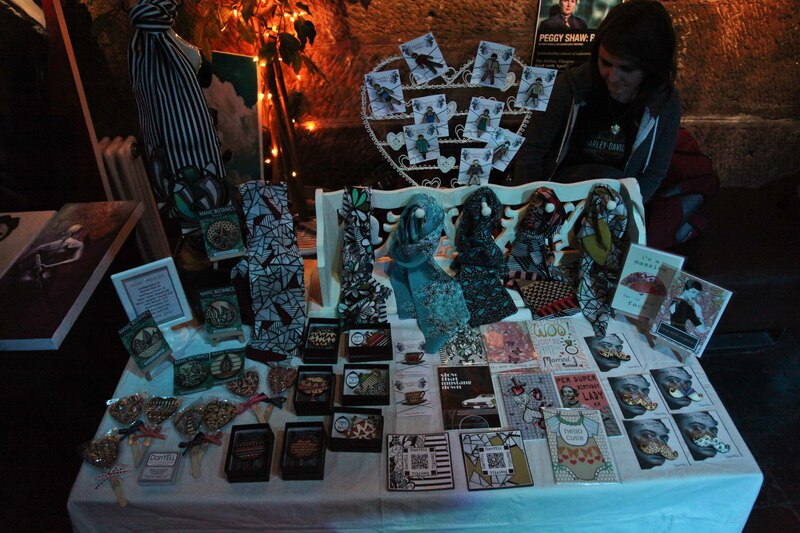 And if all of this has whet your whistle, get out and browse at the edgy craft sale Gin in Teacups. It’s run by vintage queens Laurie Macmillan and Sarah Lawson, and is back this weekend. See details below.